Getting up in the morning is one of the most difficult things for most people to do in the world. Sometimes people throw their alarm clocks when they go off. These days people might even accidentally throw their phones that they use as alarm clocks too. 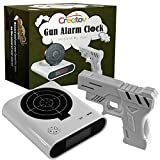 Why risk that damage when you can buy an alarm clock made specifically for being used as a target--such as the one of a kind Creatov® Gun Alarm Clock. This is set that features both a clock and gun that comes with realistic shooting sound effects to enhance the fun shooting activity. Start your day off with a BANG with our exciting 12 hour Gun & Target Alarm Clock Set. The moment you take out this gun and shoot the target it goes into snooze mode. With this clock you can record your own wake up message or music too. We give you the ability to completely personalize and control your wake up recordings to make the experience all that much more exciting. Your recording plays for about 3 minute and right after the target will pop up on the clock. That’s your cue to grab your gun and shoot the bull's eye. When you shoot once it goes to normal mode, when you shoot it five times in the hard mode it gives you another five minutes of sleep!